Get ready to dig in to my archaeological mystery, Ground Truth. When Scottish archaeologist Jamie Walker accepts a summer gig as treasure hunter for hire, his colleagues are sure he's about to lose much more than he'll ever find, starting with his reputation and probably his job. Walker and his longtime friend and fellow Edinburgh University lecturer Ian Mackenzie find themselves where no self-respecting scientists willingly go: Oak Island in Nova Scotia, site of two centuries of real treasure hunting failure and death. The island may hide pirate treasure, Shakespearean manuscripts, or nothing at all, and Walker becomes uncomfortably aware that rather than the find of a career, he may simply face flameout. Just how hard should he work to find answers that, even if they exist, may be best left in the past? I also write about food, wine, organic gardening, travel, and family from a practical, budget-oriented perspective. After hearing me evangelize about the fun of pulling carrots, making bread, or a Rhone that tastes like charcoal, my friends sometimes accuse me of being overly romantic. Guilty. In my defense, however, these simple things feel more important than ever. I am the author of several cookbooks in the Complete Idiot’s Guide series, including 20-Minute Meals, 5-Minute Appetizers, 30-Minute Meals, Quick & Easy Low Carb Meals, and my favorite, Cooking for Guys. That title serves up cooking inspiration and humor for kitchen-shy guys, has been mentioned in the New York Times and the Boston Globe, and can be found on shelves from Boston to Sydney. Here's my Bookstore. I provide recipes and content for the Powisset Farm CSA (part of The Trustees of Reservations), and other organizations devoted to supporting local food. On the decidedly more indulgent side, I created over a hundred Restaurant Recipes for the Phantom Gourmet television show. The Phantom crew filmed these epic dishes in my kitchen west of Boston. I have been a lifeguard, a Christmas tree salesman, a vacuum cleaner salesman, a healthcare regulatory customer service rep, and a mall Santa. I build dry stone walls for fun. I love photography almost as much as I love to write. Much of my work features my images. I am a member of GrubStreet, a creative writing center in Boston; and a member of The Writers’ Loft, a non-profit writing community in Sherborn, MA. I earned my BA from Union College, and my MBA from the University of Edinburgh. 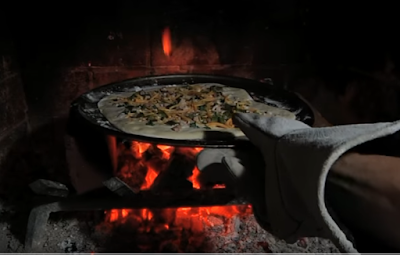 Crisp crust, melted cheese, and smoky spice all combine in this delicious, fun variation on the Alsatian “Tarte Flambée”, cooked right in your own fireplace! For similar flavor but less risk, you can grill it. Or even use the oven (zzzz). The wine? Try a Trimbach Reisling. For the cook: Practical guidance from a seasoned (get it?) food writer and cookbook author. I love simple, flavorful, elegant dishes that use seasonal, local foods. Take a look at the Wine Minute, and at the recipes on Pinterest, and tell me what you think! For the wine lover: Subscribers tell me they want practical wine buying information. With the info here, you’ll know how to find wines you like - which is not the same thing as wines with a high rating! You'll know how to find the best values on restaurant wine list s, and what to serve with that local roast chicken. This knowledge builds on more than recommendations - just because I love a wine doesn’t mean you will. So along with reviews, you’ll find the back story; context to enable you to find wines you love, at prices that fit your budget. My recipes run an insane range - from healthy and local for Powisset Farm (part of The Trustees of Reservations), to indulgent for the Phantom Gourmet television show. This range inspires culinary riffs - for every oreo-stuffed chocolate chip cookie I quest after its alter ego - say whole grain stevia-sweetened double chocolate chunk cookies. It's an obsession. Just ask people who have to live with me. Back to wine. Topics I cover range from “Say What?” (an appreciation of unusual varietals), and “The Zen of Zin”, to review of new organic wines. I’m passionate about wine as a part of a meal with family and friends, so my posts always include a recipe to go with that glass. Give us a try, and people will ask, "How do you always know just the right wine to buy?!" A stew of my favorite wines, recipes, and food news simmers in my blog. Most people select food first, then decide what wine will go with it. That is the perspective I take here, although it would be straightforward to plan the other way around. Remember that chicken can be served in infinite varieties, from a simple breaded cutlet (fine with Chardonnay), to a marinated grilled capon (hmm, pinot noir). Sauces also impact the weight of the wine you should choose. Finally, personal preference trumps everything. The whole point of wine with a meal is fun, pleasure and taste. If you like a wine-food combination (lamb and Chardonnay?) that the "experts" don't recommend, it might be worth trying the so-called ideal match, but after that stick with what you like! The old wisdom used to be "white wine with fish and red wine with meat." The conventional wisdom now seems to be to drink what you like; with whatever you want to eat. This freedom to match is appealing, not because I totally agree (the advice is still generally valid), but because it means that personal taste is now acceptable, and a person doesn't have to follow a decades- old rule. Nevertheless, food affects the taste of wine, and some guidelines still apply. Have any of the following happened to you? Before dinner you might enjoy a glass of fruity, rich pinot noir. Then bring out pasta with plenty of tomato and garlic, and suddenly the luscious red wine vanishes, leaving in its place a tart and tough imposter. How can this happen? The acid in the tomato sauce mugged your wine. Those German white wines, gewürztraminer and Riesling, that we thought were too sweet are suddenly refreshing and delicious when paired with curry, or a spicy Thai dish. The slight sweetness of these wines brings some weight and balance that fits well with the food's spice. A delicious Chardonnay suddenly turns to water after a bite of lamb. Why? The wine was no match for the fat, salt, and seasoning of this rich meat. The simple awareness that eating food with wine affects its taste (and vice versa) is valuable. Use this awareness to learn and experiment with what you like. Listed below are some general suggestions for types of wine and the food that goes well with it. This is a very general list, remember that chicken can be served in infinite varieties, from a simple breaded cutlet (Fine with Chardonnay), to a marinated grilled capon (Hmm, Pinot Noir). Sauces also impact the weight of the wine you should choose. Check back again as we add recipes under each of the food categories. Here's a classic match to keep in mind: Chianti and tomato-sauce dishes. Chianti, the Sangiovese-based wine of Italy, is often a light red with pleasant acidity (that's the bite and tartness you taste), an acidity that matches the acidity in tomatoes. Pasta and Chianti a natural match! Unless you know what you're looking for, don't feel the need to spend more than $15 per bottle. There are plenty of tasty, high- quality wines out there that can be purchased for less than $15, and often less than $10 per bottle. Wine, like food, is about fun. A glass of wine is a natural with a meal, and can help turn dinnertime into a quiet celebration. Anything that helps make a weeknight meal an event to anticipate is okay in my book. To enjoy wine with a meal, don't get preoccupied with details. Take some of the basic advice here, and test it out at your own table. Then, after you've tested a few different choices (I can't stress this enough), stick with what you like! ... And even more (indulgent alert!) at the Phantom Gourmet. Once upon a time, Rachel received a big promotion. She took her staff to a popular new waterfront restaurant. The group gathered around the table, and the waiter presented Rachel with a long wine list. She took the list, and realized she did not recognize a single wine. She glanced around the table. In the past she had asked others for advice, but she had become more confident in her choices, and she knew what to do. Among the white wines, she found a good selection of New Zealand Sauvignon Blanc, and for reds a list of Shiraz from Australia. She knew both of the regions to be reliable for these wines, and between the two there would be something to accompany all types of food. She chose a moderately priced wine from each section, and sat back to see the reaction. Her picks were instant winners. For Rachel, as for many people, ordering wine at restaurants used to cause anxiety. After all, prices are far higher than at wine shops, and guests are hostages to that list. The table is watching as you choose. No pressure! But choosing wine needn’t be stressful. What if I don’t recognize anything on the wine list? that same varietal (grape) - or even other varietals or blends with similar flavor profile. A number of subscribers have asked for not just specific recommendations (which is what we do in each issue of the Wine Hotlist and the Wine Minute), but general guidance on reliable producers. These producers offer tasty, high quality wines for less than $15, and often less than $10 retail. Restaurant markups are often 200%, or even 300%, so a wine that costs $10 in a wine shop may well cost $20 (or more) in a restaurant. To give you a decent shot at a sure winner, here's our current "favorite" list of dependable sources. Print this page for your next trip to your local wine shop, or even better, to your favorite restaurant. You'll have a secret weapon for choosing wines (it will be our secret).